Home Football Betting 9/1 Saturday Footie Treble! Another weekend of Premier League action means we’ve got another tasty treble for you! After hitting the woodwork with a tremendous effort of two-out-of-three last week, we’re ready to do it all again! First off, we’re heading to the Molineux for the early kick-off between Wolves and Leicester. Both sides are a bit of a mixed bag – they will play brilliantly one week and then play awful the next. They have both registered some tremendous recent victories against the top six – Spurs and Chelsea in Wolves’ case, and Chelsea and Manchester City for Leicester. However, against the sides that these two ‘should’ be beating, their form is very poor. Wolves’ last game at home was a 2-0 defeat to Crystal Palace, meanwhile Leicester followed up their excellent win against City with a 1-0 defeat to Cardiff. That’s what makes this game so intriguing. 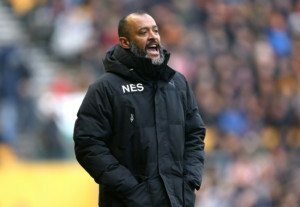 Nuno Espírito Santo’s (below) side were superb in their FA Cup tie against Liverpool, which was at the Molineux, and they’ll be hoping to replicate that sort of form against the Foxes. Leicester have only scored one goal in each of their last four games, so we fancy Wolves to have the firepower to take all three points. We’re going for a Wolves win at 13/10. Next, we’re heading to Old Trafford where a resurgent Manchester United host Brighton. Ole Gunnar Solskjaer has won his first six games in charge in all competitions, with the best of the lot coming last week against Spurs (with some help from David De Gea). Paul Pogba seems to be reborn under the Norwegian, and Marcus Rashford seems to be thriving under Solskjaer’s guidance. Brighton haven’t been great away from home this season, but who can forget their victory over United on their home turf. A narrow 1-0 defeat last week to Premier League leaders Liverpool will give the Seagulls some encouragement going into the game at Old Trafford. This seems to be a different United however, and the Reds are well and truly back in the hunt for the top four, with the gap now just sitting at six points. With Arsenal and Chelsea playing each other, it could be a pivotal weekend for Solskjaer’s men. We think Solskjaer (below) will make it seven wins from seven at 2/7. Finally, we turn our attention to the game of the weekend, which sees Arsenal and Chelsea face off at The Emirates. This one will surely be crucial in the race for the Champions League places. Neither side have been consistent in recent weeks – Chelsea suffered a goalless draw the week before last against Southampton, and Arsenal were second best against West Ham last Saturday (as we predicted, might I add). However, the Gunners have won their last 4 games at home in the league, and Chelsea have won just once in their last six visits to The Emirates in all competitions. Despite Chelsea’s away form being strong (seven wins out of 10 away games this season), Spurs are the only top six side they’ve faced. Combine that with their poor record at The Emirates, and we can’t see anything other than an Arsenal win. We’re backing Unai Emery’s side to take the points at 2/1. Trader’s special price for the treble: 9/1 – click here to bet!